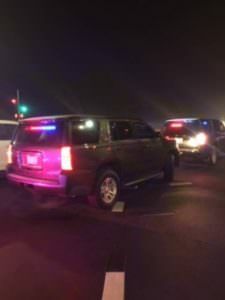 NARRATIVE: DOUGLAS COUNTY, CO – On 02/06/2019, at 0207 hours, patrol deputies with DCSO attempted to perform a traffic stop on a vehicle traveling at high rate speed northbound Highway 85 at Daniels Park Rd. The vehicle refused to stop and continued traveling northbound on Highway 85 at excessive speed. A pursuit took place and several deputies were dispatched to assist. Responding deputies staged along Highway 85. One deputy was ready with stop sticks at the intersection of Highway 85 and Highlands Ranch Parkway. Suspect vehicle continued traveling northbound on Highway 85 using the southbound lane at high rate speeds. At approximately 0217 hours, the suspect vehicle was approaching the intersection of Highway 85 and Mineral Ave. The suspect vehicle crashed into an unrelated vehicle traveling westbound on Mineral Ave. The unrelated vehicle was occupied by two people. Both occupants of the unrelated vehicle were killed. It was confirmed that the suspect vehicle was stolen out of Aurora. The driver of the suspect vehicle was taken into custody. Littleton Police Department will be handling the crash investigation while Douglas County Sheriff’s Office will be handling the criminal investigation. The RTD located west of Highway 85 on Mineral will remain closed while authorities perform the investigation on scene.